This article gives you all the details for taking a day trip to Gori. It includes all the information you need about how to get to Gori as well as what to do when you’re there and how much everything costs. Gori is an unremarkable town slap-bang in the middle of Georgia. However, it is slowly gaining popularity due to a celebrity birth which took place over 100 years ago. Joseph Stalin began his life as Iosif Dzhugashvili on the mean streets of Gori and while he’s not exactly a Georgian hero, the town preserves memories of his life and displays them in the Stalin Museum. The museum is becoming a top attraction in Georgia and hordes of tour buses pull up outside the museum daily. But you don’t need a tour to visit this obscure tourist attraction. A day trip to Gori is easy and cheap to do independently and can be combined with a trip to the ancient cave city of Uplistsikhe. A day in Gori is more than enough time to see the main sights of the town and get back to Tbilisi. Marshrutkas (minibus) running between Gori and Tbilisi, makes a day trip to Gori from Tbilisi very easy! The cheapest way to get to Gori is by shared mini van or marshrutka. To get from Tbilisi to Gori simply head to Didube bus station and look around for the van labelled ‘Gori’, usually written in both Georgian and English. Drivers will point you in the right direction if you can’t spot the right van. A ticket to Gori costs 3GEL per person and the marshrutkas leave when full (usually every 20-30mins). The journey to Gori takes around 1.5 hours along new highway. The driver will drop you next to the museum if you ask although the town isn’t big so it’s not a problem if you end up going all the way to the bus station. If you prefer to go by private transport a tour costs around 50-60GEL per person to visit Gori and Uplistsikhe. Tour agencies in Tbilisi will also be able to organise a private driver for a similar cost. There are not a huge amount of attractions in Gori but if you go on a nice day you can definitely spend a couple of hours wandering the sights. The Joseph Stalin Museum and the Stalin house are the best things to see on a day trip to Gori from Tbilisi. Let’s face it, your probably taking a day trip to Gori purely for this guy. The Stalin Museum is the main attraction in Gori and is definitely worth visiting. The museum consists of several impressive galleries displaying paraphernalia from throughout Stalin’s life including photos, newspaper articles, a collection of odd Stalin-themed gifts and his death mask. A ticket costs 10GEL for adults and an additional 5GEL to enter Stalin’s train carriage displayed outside. There are free tours in English and in Russian but there are not at set times, you simply purchase your tickets and ask when the next tour will be. Depending on how busy it is that day you may have to wait a while for the tour. We went without a tour but there isn’t much English information. Visit the Joseph Stalin statue outside the Stalin house in Gori, one of the best things to see on your day trip to Gori from Tbilisi. The gardens around the museum are lovely in the summer and plenty of benches to sit on. You can also see Stalin’s childhood house, his train carriage and a large statue of him. The second museum you can visit on your day trip to Gori. Gori also has two other, smaller museums for those who are in for a day of historical education. The War Museum is open everyday except Monday, 10am-6pm and the Ethnographic Museum is open everyday from 10am-6pm. It costs 3GEL for each museum and there are English speaking guides available. The Gori Fortress is a short walk from the museums and is free to enter. Not a lot remains of the fortress but there are some nice views of the town and surrounding hills. At the foot of the hill are a collection of statues which used to be on display in Tbilisi’s Vake Park. The large warrior statues are a memorial to Georgia’s war heroes. As with every Georgian town there are several churches and all of them look lovely. We found Mary's Church to be the most impressive but there are several other smaller ones that you’ll come across as you wander through the town. We didn’t go inside any but it’s usually free to enter churches in Georgia. Stalin Avenue is the main street in Gori. At the top end is the Stalin museum and gardens and the wide boulevard stretches the length of the town. There is some impressive architecture along the street including the huge city hall. There are street signs on every corner which are a great tourist photo opportunity! If you get off the main road you'll see some real Georgian living on your day trip to Gori. The town of Gori is small and not exactly beautiful but there are hidden secrets to be found in every town and it’s nice to take a short wander through the town. There is an area that has been recently restored and looks lovely but very new. This area is also completely populated with second hand clothing stores so if you like quirky retro clothing have a rummage and find yourself a bargain! It’s popular to combine a day trip to Gori with a visit to Uplistsikhe. This is an ancient cave village located about 10 km from Gori. To get there, head back to the bus station and find a minivan heading to Uplistsikhe, most signs here were only in Georgian so ask some of the drivers. The journey takes around 25 minutes and costs just 1 GEL. For more detailed information check out this post about visiting Uplistsikhe. If you are interested in other Georgian attractions read about twenty awesome things to do in Georgia. Don’t leave too early. The museums don’t open until 10 am and there are lots of tour groups. Go a little later in the day, we arrived at the museum at 1 pm and it was busy, but many tour groups were just leaving and the inside was mostly empty. Take a camera. Photography is allowed all throughout the museum. Brush up on your history first. If you don’t want to wait for an English-speaking tour, read up a little before you go so the displays have more meaning. There are only a couple of small cafes near the museum and mostly they sell fruit and baked goods. So eat breakfast before you leave and grab a khachapuri and sit in the museum gardens for lunch on the go. Read more about the best Georgian food. Bring a refillable bottle. There are plenty of drinking fountains around Gori for you to fill up at. It's not really worth staying in Gori as there isn't much more to see and Tbilisi is so close by. For budget travellers, we highly recommend the cosy rooms and free pancakes at Pushkin 10 Hostel - check prices here. 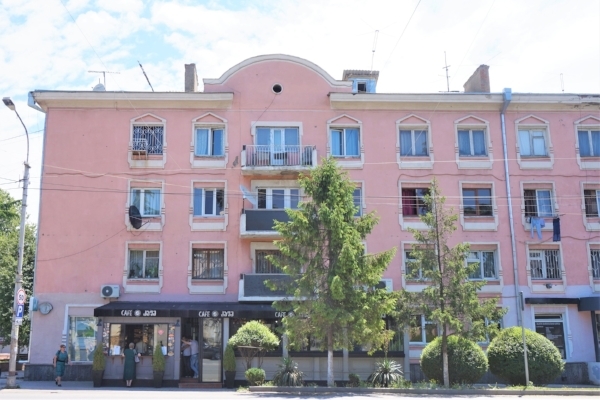 As a more up-market option head to Old Meidan Tbilisi. As a splash out the Rooms Hotel can't be beaten for chic design and amazing food - check prices.